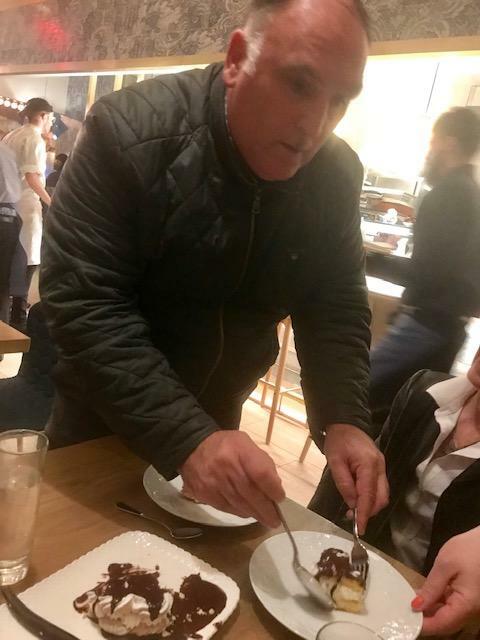 I got an email contact for chef José Andrés from Gerry Dawes, a friend and importer of Spanish wines. 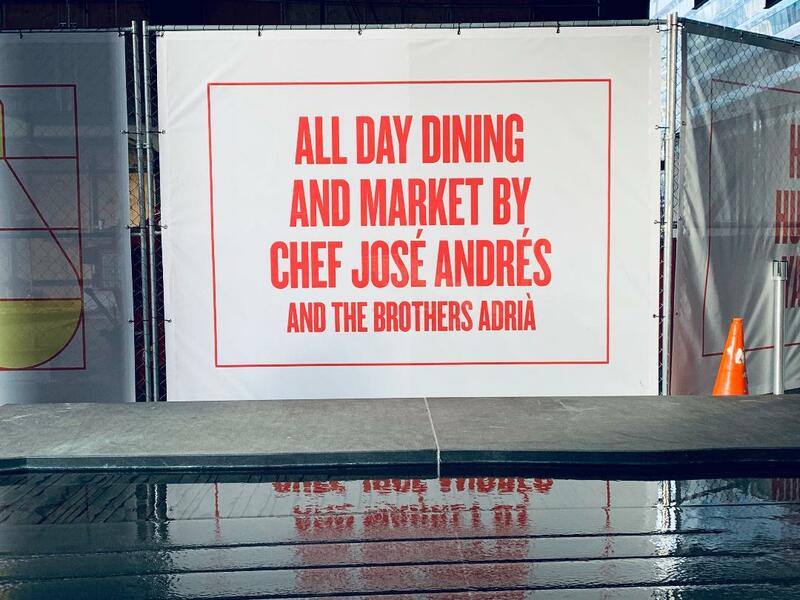 He sends me photos of a very early tasting at Mercado Little Spain in Hudson Yards with Andrés and his partners, Ferran and Albert Adria, hosting too. “I know you’re not open yet, but can we come for friends and family?” I write José. “We are still in training but will be awesome to see you. Way too long!” José responds. The Mercado Little Spain entrance is easy to spot as your cab heads east on 30th Street. 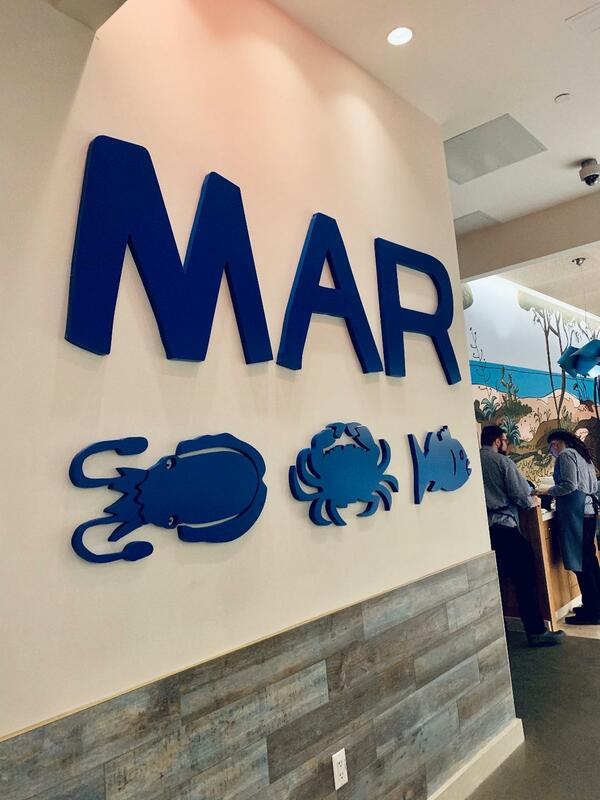 I follow a guide to Mar, the Little Spain restaurant focused mostly on water creatures. 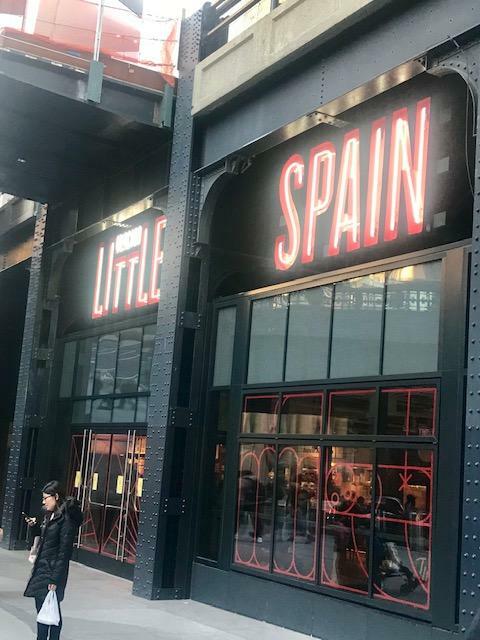 Little Spain, entrance boldly signaled on West 30th Street, just west of Tenth Avenue is the easiest feeding station to find at Hudson Yards where seeking dinner can mean an escalator, elevators and long walks with confusing instructions, past fancy shops that may or may not distract. 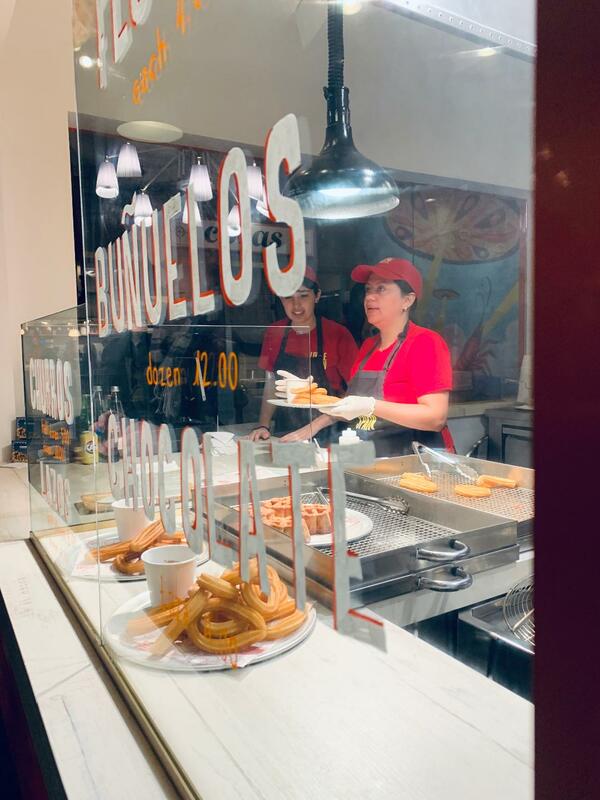 Welcome snacking, dining and shopping at the Mercado even if you lament an aura of excess at the Yards so far and to-come. My friend, Photographer Lyn Hughes, caught this sign on her way to join us for dinner at Mar. It’s been many years since I’ve seen José. Now he’s a hero bringing meals to devastated storm sites. José stands behind my friends encouraging us to taste everything that lands on the table at Mar. 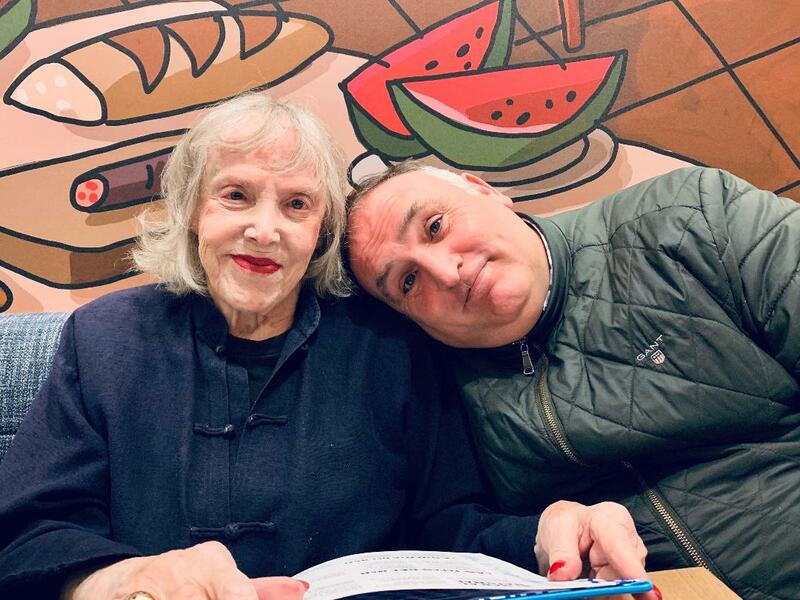 Heading to Mar in Little Spain for a mostly-seafood tasting with José Andrés. 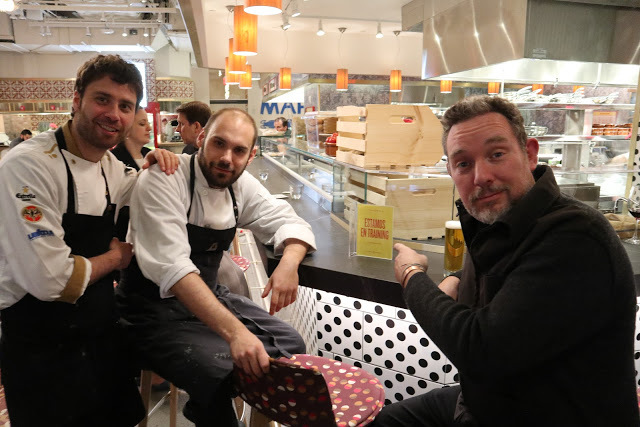 I haven’t seen José since 2002 when he came to introduce my and my guy, Steven Richter, Richter, to his friends in Barcelona for Food Arts magazine. 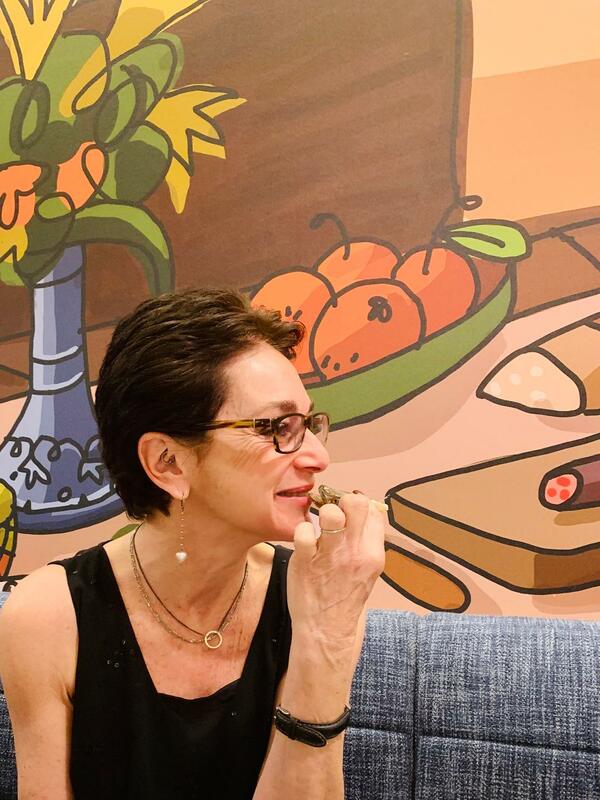 (Click here to read Barcelona Dine-a-Thon). 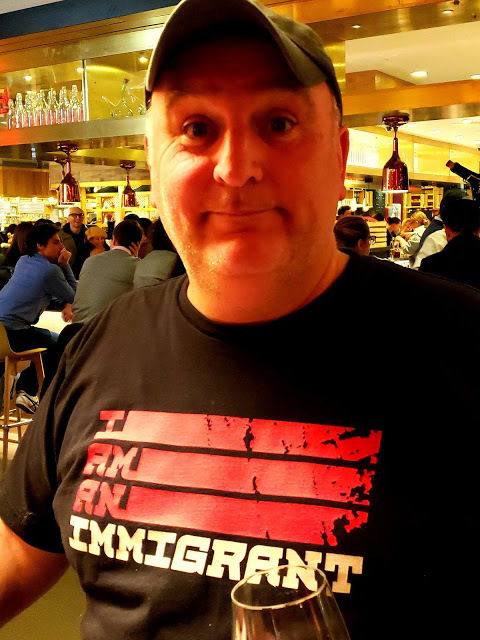 The chef of Jaleo in Washington D.C., sweetly homesick for Barcelona and Catalunya, he had not yet grown into the feeding hero of catastrophes and Nobel Peace Prize nominee that he has become. My niece Dana Stoddard shot this scene as she explored the market stalls. It’s been an exhausting week for José who relaxes on my shoulder in the booth at Mar. 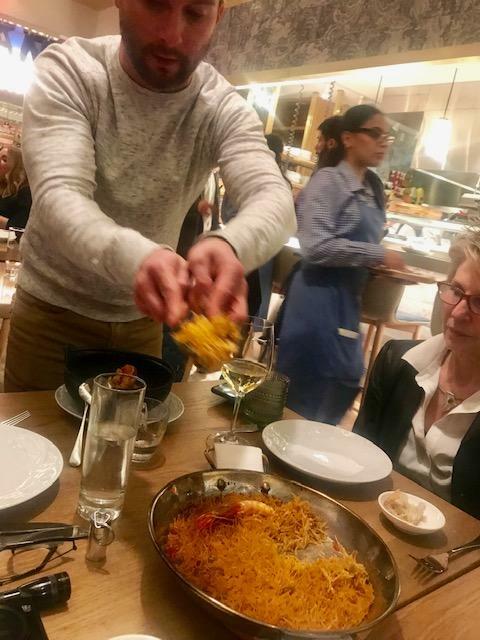 José instructs our server to bring more dishes to our table. I seem to be the one eating raw tomato slices with seaweed. Our server brings a second. He gets up to discuss our case with a young man in the house signature apron. Soon, half a dozen cod fritters come lined up on a platter with honey aioli. I take the first bite. It’s a thrilling combination. 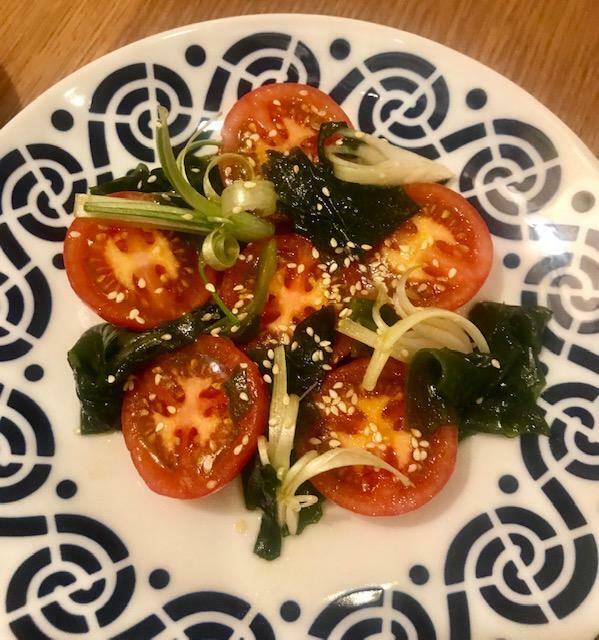 I seem to be the only one interested in sliced tomatoes with scallion curls, seaweed and sesame seeds. My niece Dana and our friend, the photographer Lyn Hughes, have gone off to shoot. Rings of fried baby hake need to be skinned and boned. Dana is an expert. My friends suggest Dana pose for a photo kissing the head of a baby hake. 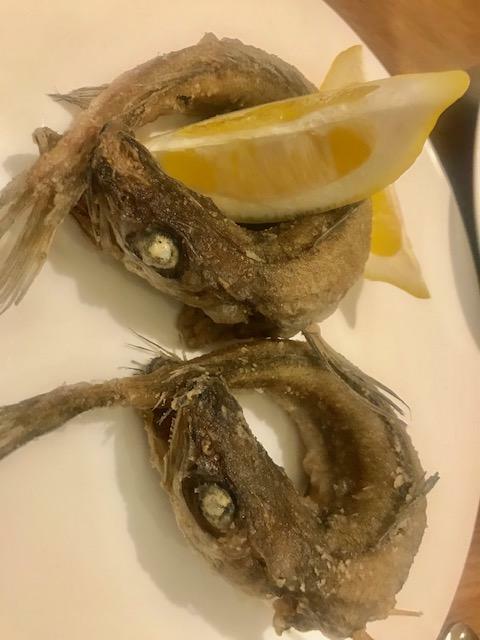 Dana returns, shivering with excitement when a server sets down a duo of baby hake, fried in gray curls with a wedge of lemon (“like Mama used to make” says the menu.) Dana immediately begins skinning and boning one and poses kissing a head. 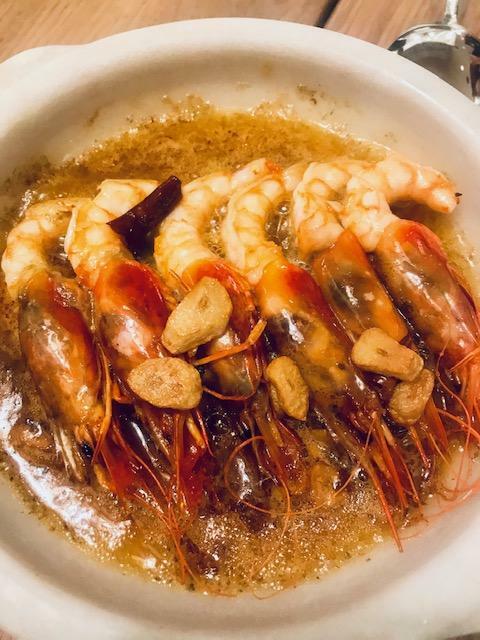 I prefer what the menu salutes as “The very, very, famous tapa of shrimp sautéed with garlic.” There are peel-and-eat shrimp, too. 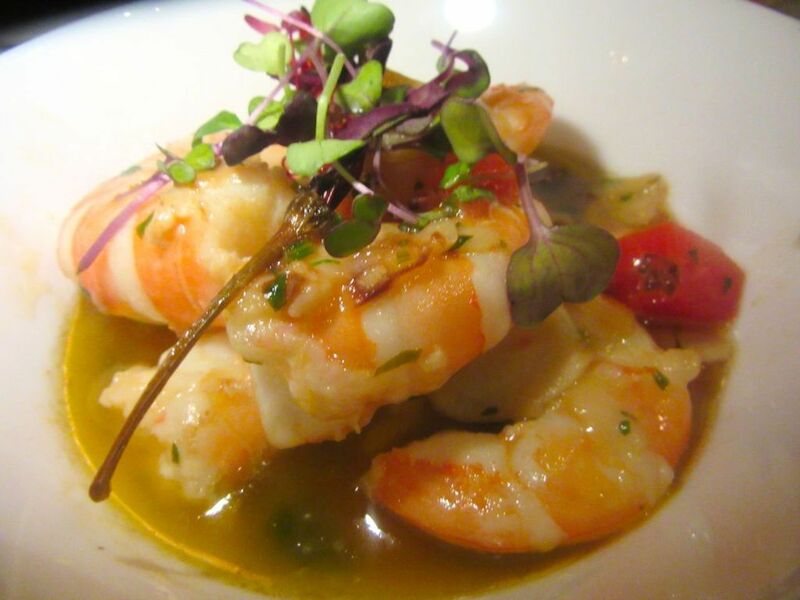 Can you ever have too many peel-and-eat shrimp? These are fresh and sweet. A small serving of scallops with chopped cucumbers, tomatoes and peppers is just enough for four tastes. 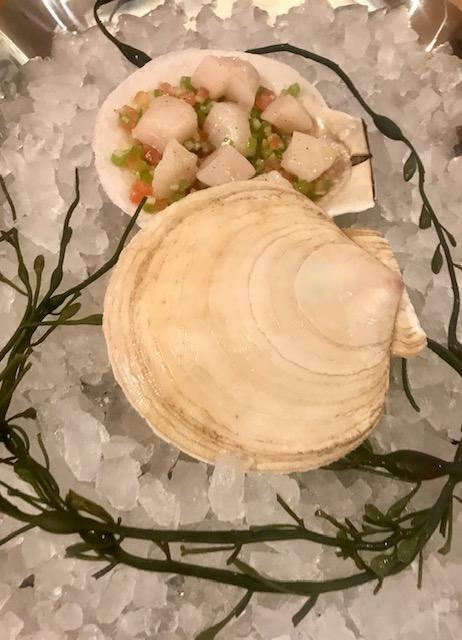 Delicate little bay scallops are served in the shell with minced tomato and peppers. I ask for saucers so we can ladle portions of fisherman’s stew with potatoes and shrimp from the pot. “Do you have any pork?” Lyn asks. “A cut from the loin served with olive oil potato puree?” the server offers. We send her off to find some. 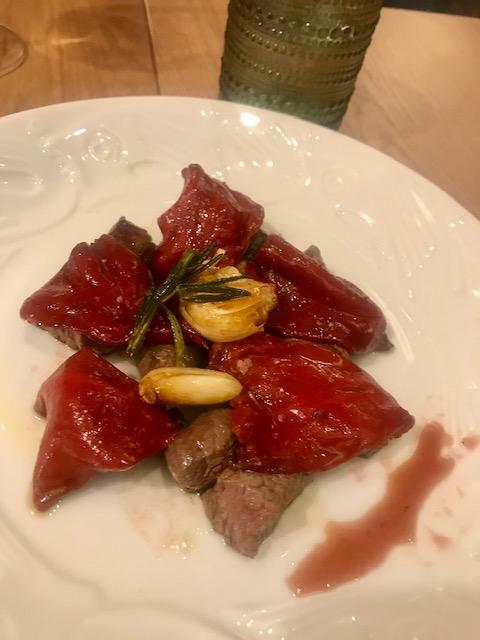 The server at Mar brings crusty tenderloin tips with piquillo peppers. A strolling server dishes up crisp fideos noodles dotted with seafood. 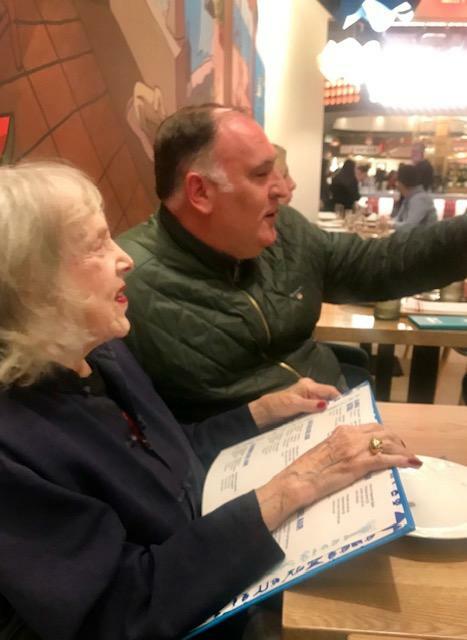 I signal another server and ask for paella but apparently the classic rice is not on Mar’s seafood menu. Instead we get a thatch of fideos noodles with more water creatures. José divides a chocolate dessert into four islands of meringue. 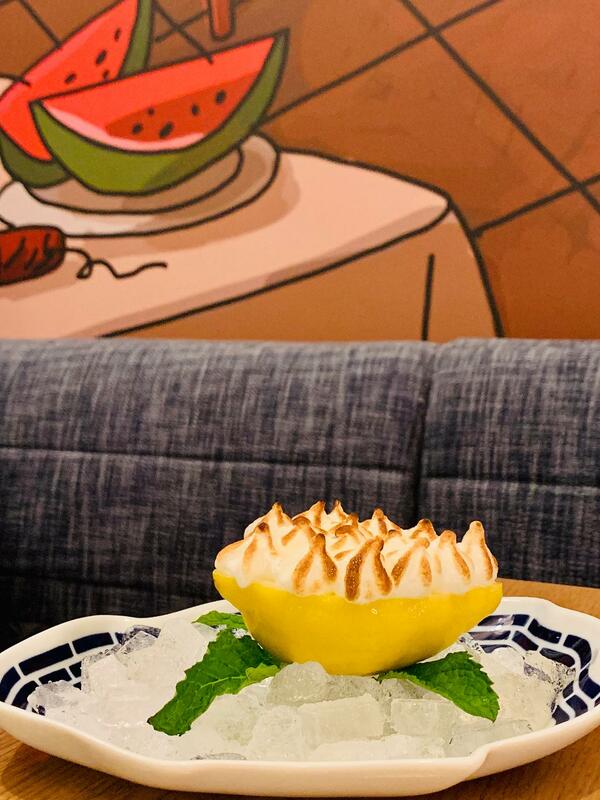 On the menu at Mar is lemon sorbet in a toasted meringue. “I don’t think I can eat another bite,” I say after finishing off yet another shrimp. “Maybe we should skip dessert.” No, too late, it arrives: Mini lionesas – crunchy cream puffs with vanilla ice cream and warm chocolate to pour on top. Lemon sorbet with toasted meringue. And egg yolk custard with oloroso cream and caramel. 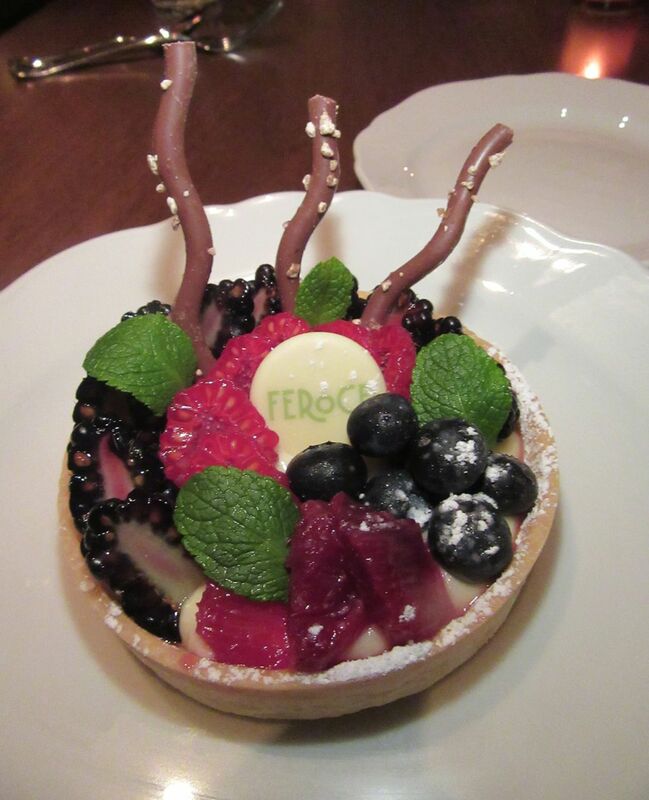 Our table at Mar is covered with a numbing assortment of desserts. “In Spain we sell so much wine we use all the egg whites to clarify the wine,” José explains. 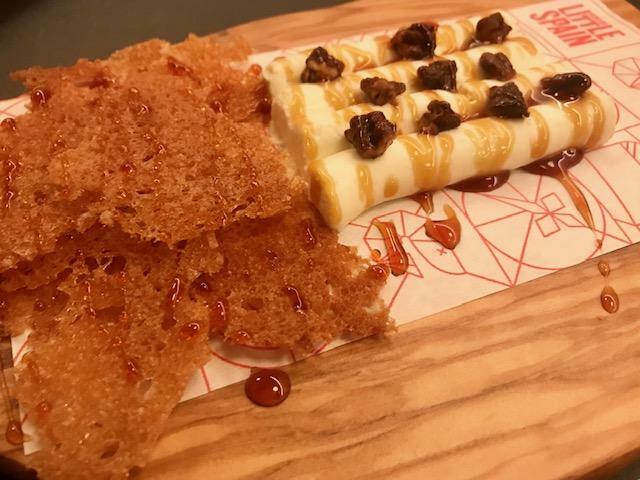 “That leaves thousands of egg yolks, which is why we have so many custards.” The Tocino de Cielo, bright yellow custard with oloroso cream and caramel, is small and wonderfully rich. Three tablespoons dip in and it’s gone. I ask for the check but there is none, says our server. “We’re not open yet.” I find our original server and fill her pocket with twenties. 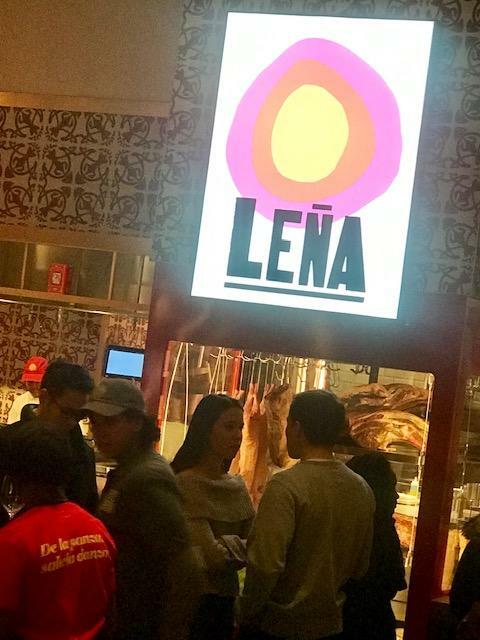 Two evenings later, three of us follow the sign leading to Leña to explore a very different menu. 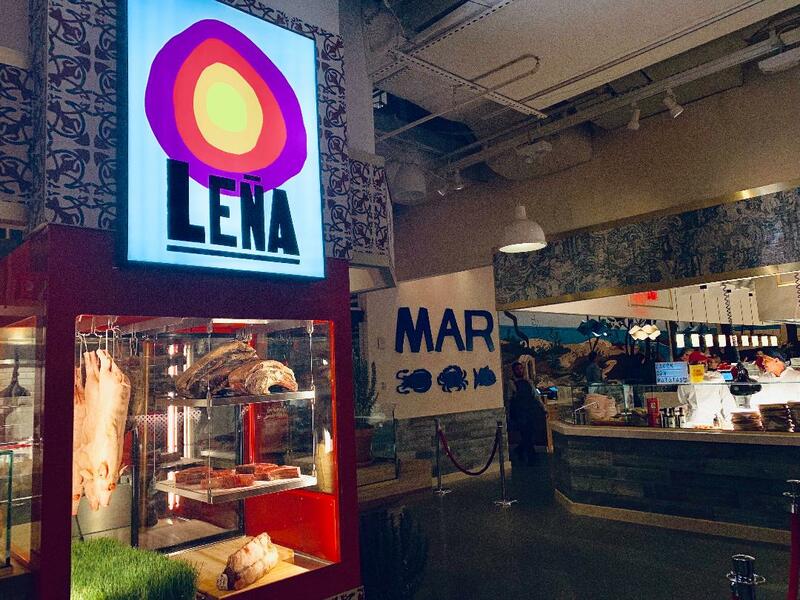 Two evenings later we are back to explore the menu of Leña, the mostly meat restaurant adjacent to Mar in the rear of Little Spain. José has gone with his assistant Satchel to bring emergency meals to the flooded areas of the Midwest. (Sunday they were delivering 10,000 meals to Mozambique.) But the crew at the VIP rope recognize us and find us a table. I feel better about being mistaken for a free-loader, when I see the Leña menu lists prices. 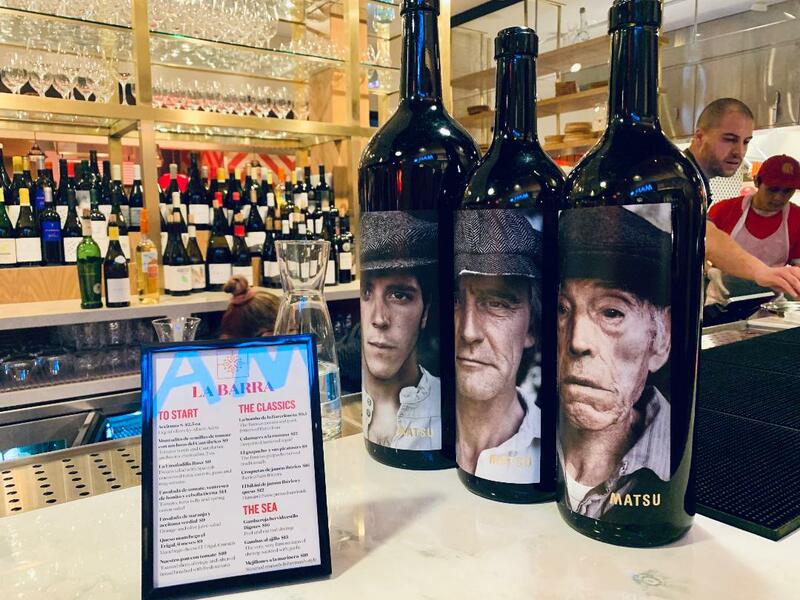 I don’t know what these wines are but I love Lyn Hughes' photo of the bottles. Wines by the glass cost from $7 to $22 (but mostly $12). Starters begin at $6 for the gazpacho (we share a huge bowl) to $22 for beef tenderloin tartar mixed to order. 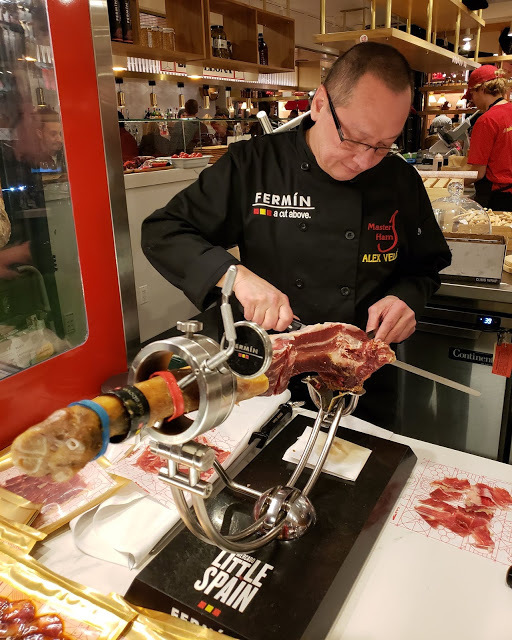 Acorn-fed, black-footed Iberico pig served with gem lettuce salad is priced at $38 to $49 for 8 ounces and Black Angus steak is $76 a pound. Whole pigs at $540 must be ordered 24 hours in advance. I’ll keep that in mind. One might be the centerpiece of a birthday party. Dinner at Leña starts with two or three different breads and scraps of cured ham. Dana goes off to photograph the cured-pig slicing and returns with a plate of small scraps. 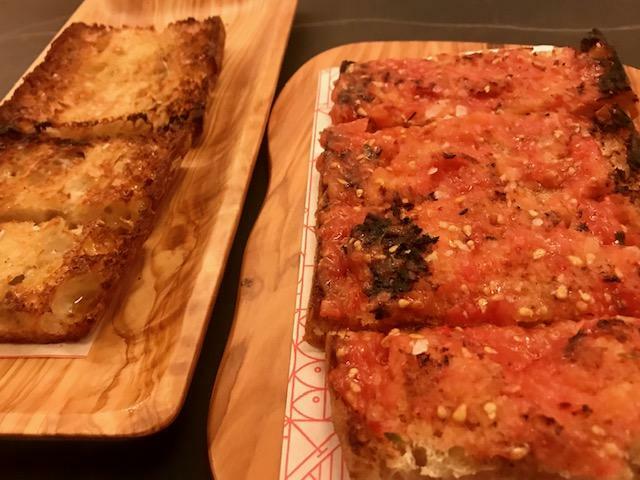 We ask for bread and get simple toast and an order of pain de tomate – “uniquely crispy and ethereal bread brushed with fresh tomato” the menu lyricizes. There is also a platter of grilled bread with pork sausage and tetilla cheese. 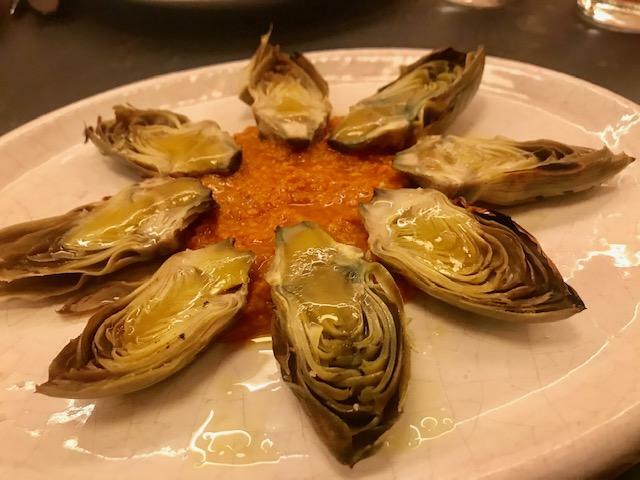 Halves of small artichokes are served with romesco sauce. I’ve had better romesco. 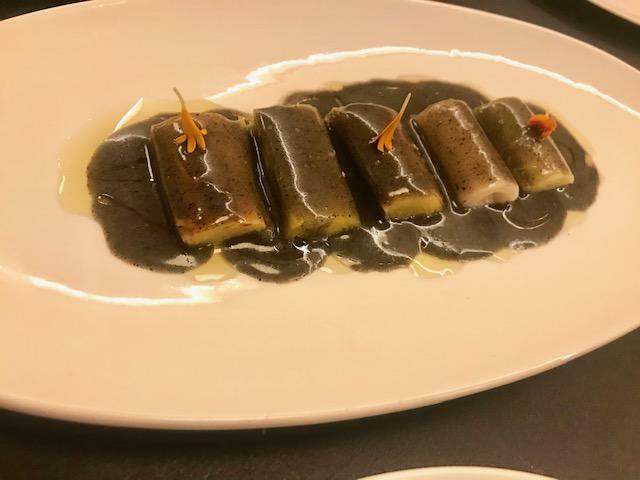 Fire roasted leeks are served with fire-ash dressing. Baby artichoke-heart halves ring a serving of romesco sauce. I remember the brilliant romesco we ate at an outdoor party in Barcelona with José and his friends so long ago. It had more punch and also more elegance. 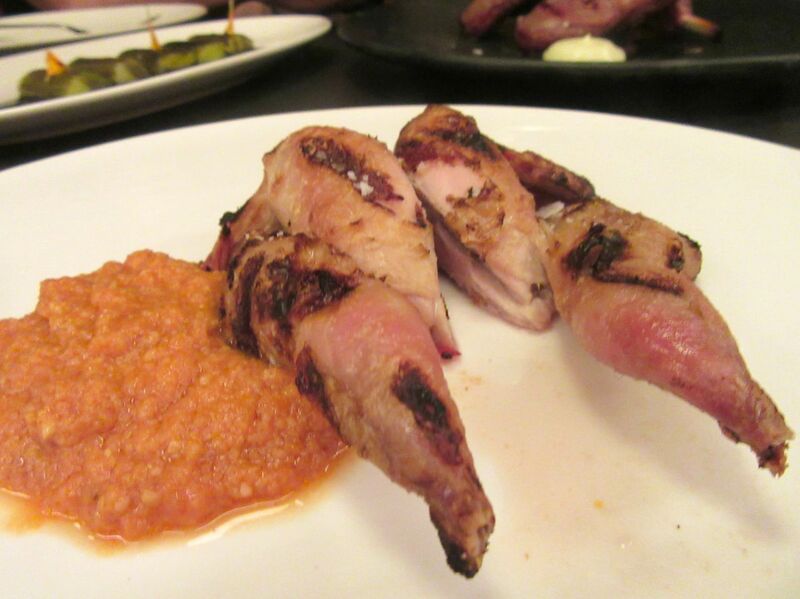 Two grilled quail, also served with romesco, are not the juicy caramelized birds I expect, but taste cooked and rewarmed. These quail are cooked in the ashes too. I’d like them better caramelized on a grill. 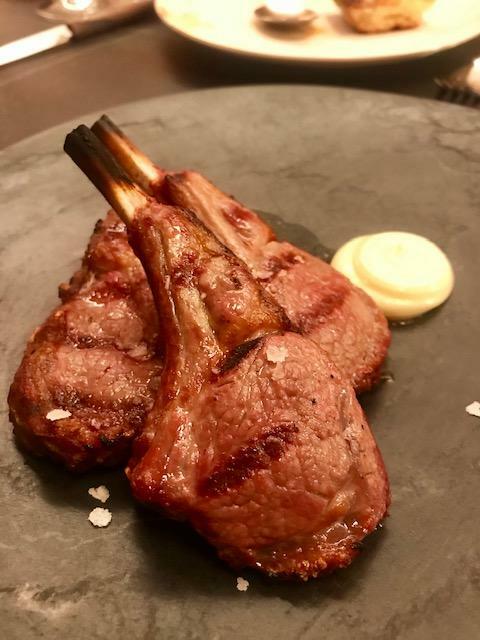 The lambs chops at Leña are perfect, rare and full of flavor. Still, the lamb chops ($32 for a half pound) are excellent: alone and naked on the plate, with aioli in a dish served separately. 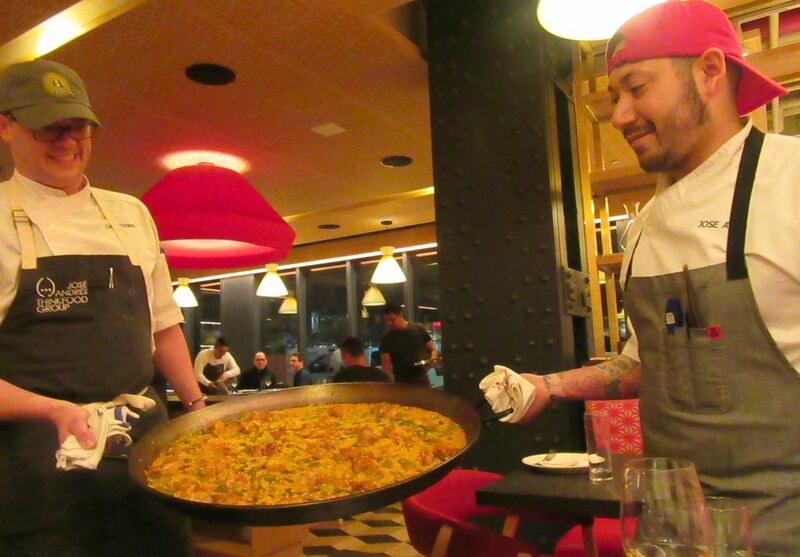 Our order of Valenciana classico is taking a while to cook. We shoot it on the wood-burning grill. Later a duo of cooks carry the finished rice to show us. “First you get yours and then we can sell the rest,” one of them confides. 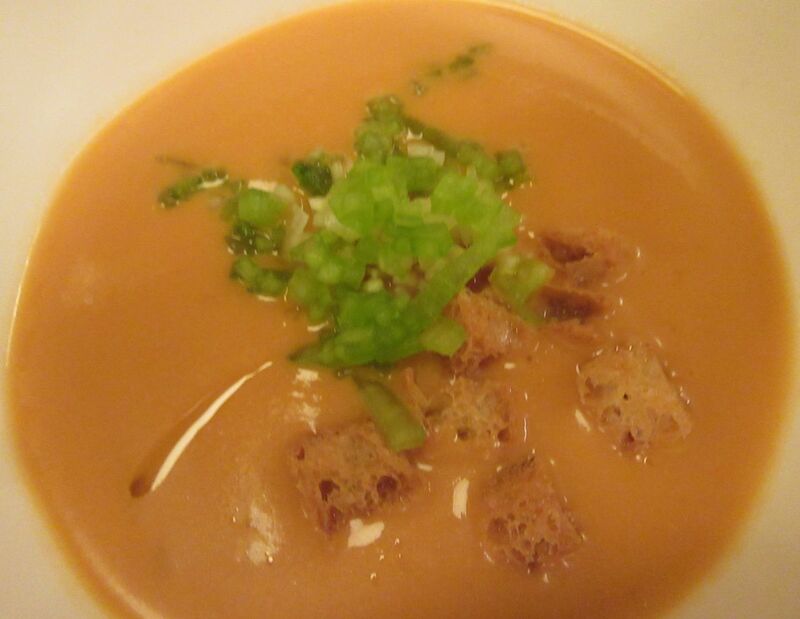 Three spoons dip into this large bowl of fragrant gazpacho at Leña. I find this paella with chicken and rabbit disappointing, and minus even an inch of socarrat. Paella can be so many things. I’ve had the classic before but don’t recall the rice so bland and the nubbins of rabbit and chicken so dry and boring, with only green beans for color. Worse, even fatal, is the absence of socarrat -- the part that sticks to the pan that you have to scrape out and then fight over. The desserts are especially good tonight. 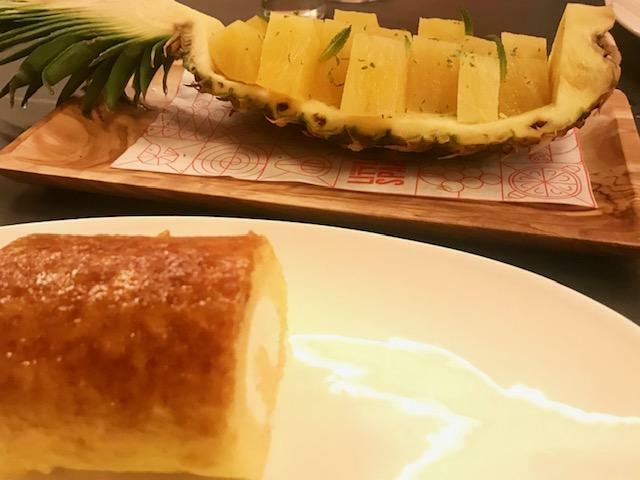 Pineapple oozing rum, and cream-cake roll. Goat cheese with chocolate chips is served alongside chewy cookie crisps. 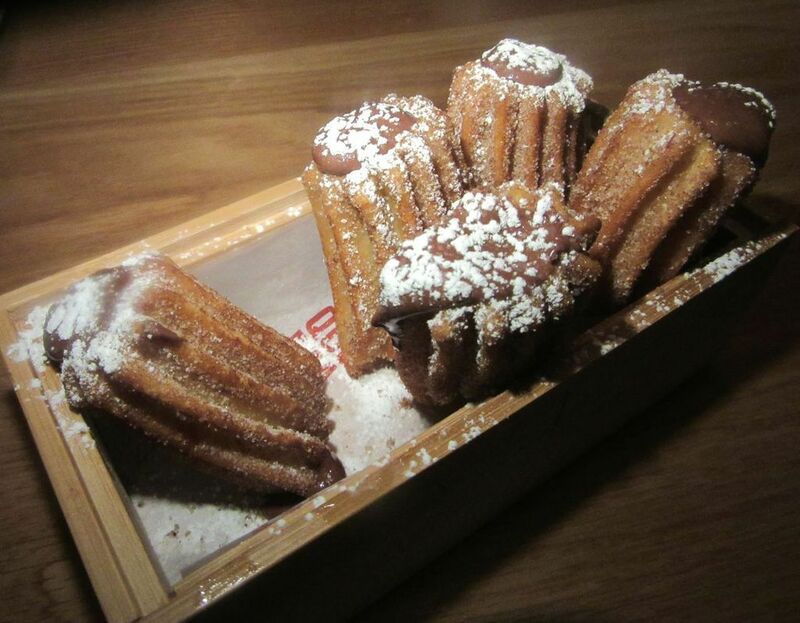 Desserts definitely make up for any disappointment. Pineapple steeped in dark rum and lime -- Pina Borracho -- seems the perfect finale after so much food. But we also have to try the goat cheese with honey and candied pecans delivered with a pile of lacey cookies. The Gypsy’s Arm is a delicate sponge cake with whipped cream and burnt egg custard. 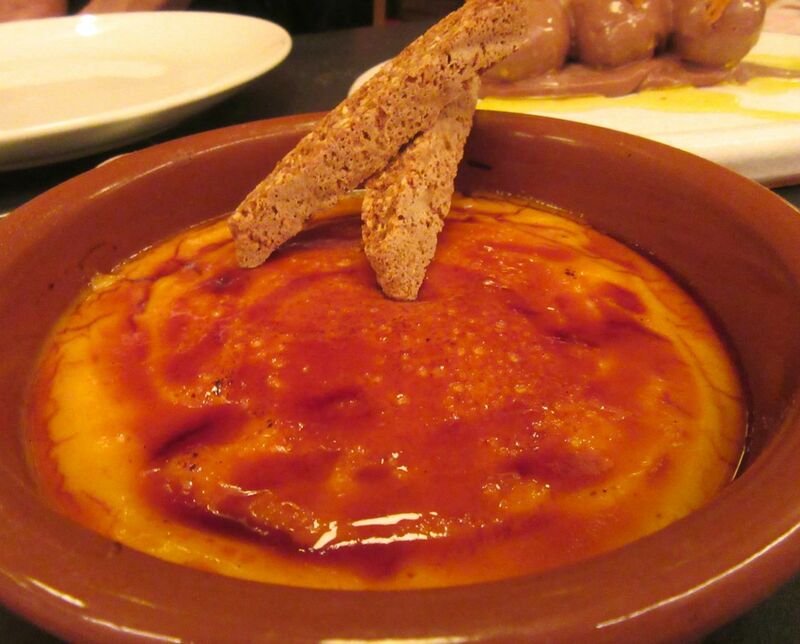 A super rich crema catalana uses up some of those infamous egg yolks. There is crèma Catalana, too, and I recall Sirio Maccioni telling me how his wife Edgi created Le Cirque’s celebrated crème brûlée after tasting créma Catalana in Spain. 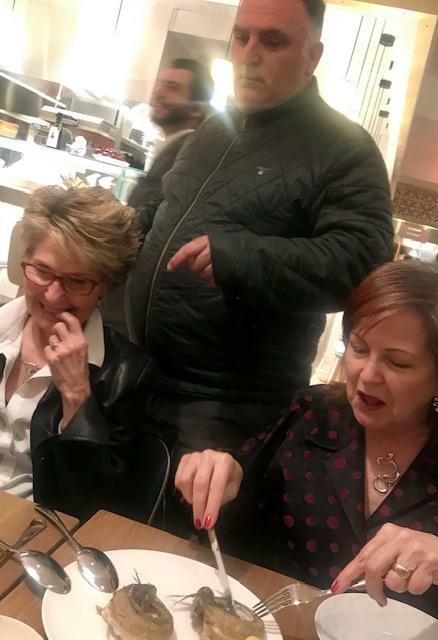 Satchel had emailed promising we would get a bill for our dinner at Leña, but when we ask for the check, the server delivers an empty leather folder. There is no one to argue with so we hand her some twenties and thank her. I need to come back to Mercado Little Spain to explore all the market stands we haven’t had time to see. There is already more activity at Little Spain. 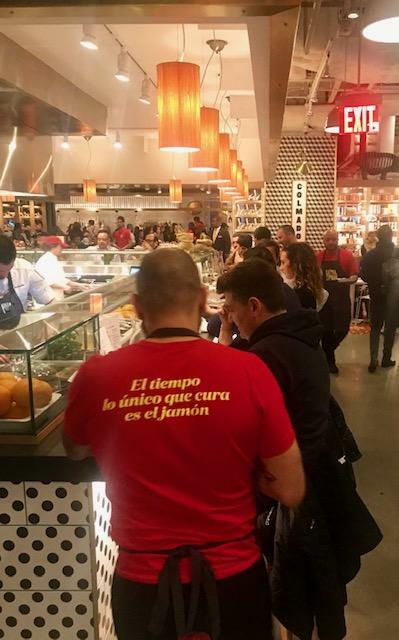 I want to spend time exploring food stands in the Mercado, taste the patatas bravas and the churros. Since I’ve given up serious cooking, I don’t need a paella pan. Maybe you do. 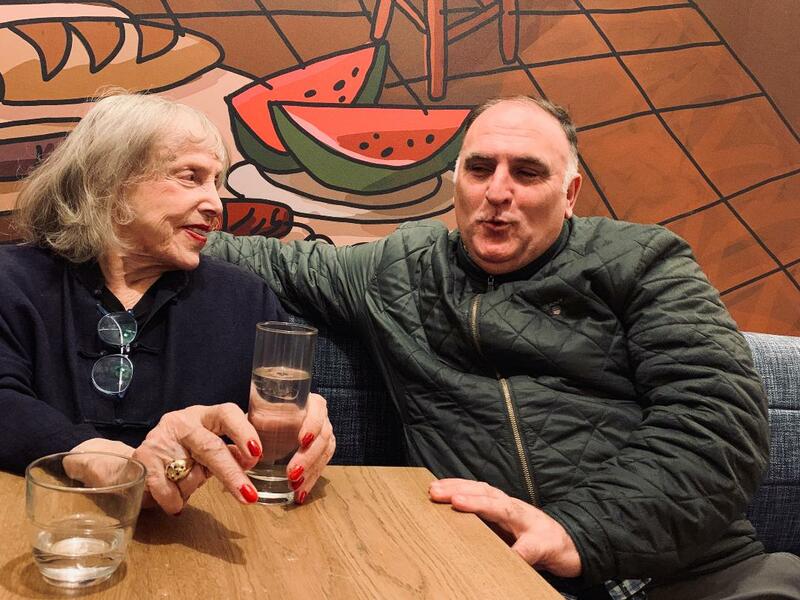 Perhaps next time I come for a sit-down dinner -- La Barra has yet to open -- I’ll pick up empanadas or gazpacho for lunch at the office. When the place officially opens, I’ll hope to see José again. He worked in New York briefly as a cook in 1991. Barry Wine remembers him in the kitchen brigade at the Quilted Giraffe. 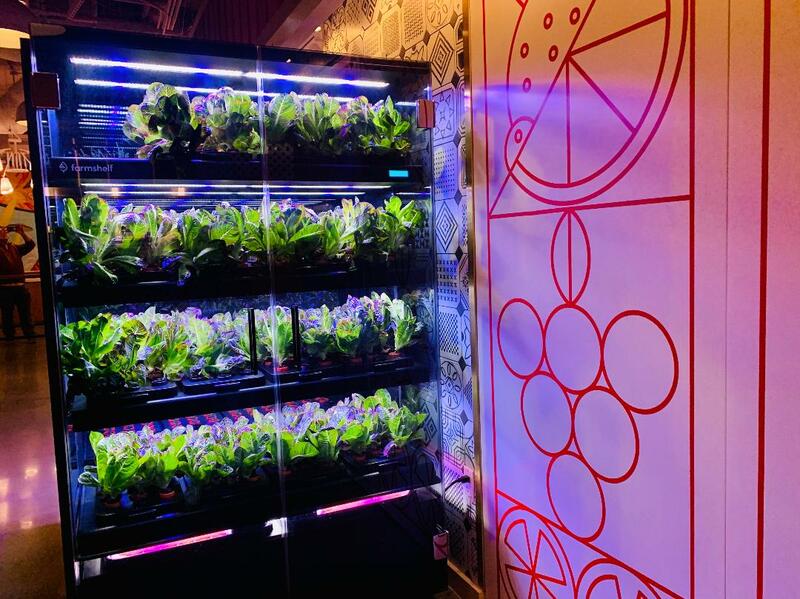 Lyn Hughes shot these baby greens as she explored the market before dinner. Mar. Leña. La Barra. 10 HudsonYards. 646 495 1242. Still training. The Mercado at Little Spain is open from 4pm to 10pm Sunday through Thursday, 4 pm to 11 pm Friday and Saturday during the soft opening/preview mode. Eventually it will open at 7 am daily.